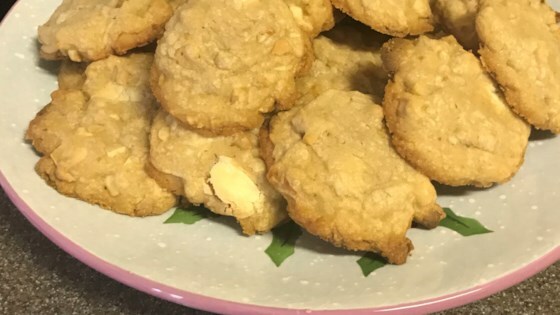 "Rich, slightly crunchy dropped cookies bursting with macadamia nuts and white chocolate chunks." Preheat oven to 325 degrees F (170 degrees C). Lightly grease baking sheets. Beat butter, sugars, egg, and vanilla at medium speed of electric mixer until fluffy. At low speed, gradually beat in flour, just until blended. By hand, stir in nuts and chocolate. Drop by heaping tablespoonfuls, 2 1/2 inches apart, onto lightly greased cookie sheets. Bake for 17 minutes or until edges of cookies are lightly browned and tops look dry. Allow to cool on baking sheets five minutes, then remove to racks to cool completely. These cookies are alright, I do like them better than all the other simular recipes on this site. They just were not the taste we were looking for. I pulled the recipe yesterday and made the cookies yesterday and brought them to some friends, we meet every Monday night. They all said that the cookies were awesome. Turned out well by taking another viewer's suggestion. Used 1/2 c. butter, & 1/2 c. Crisco, increased vanilla to 1 t. and decreased almond extract to 1/4 t.
Very good! I added extra vanilla and nuts and made with callebaut chocolate! I would make these again. they looked perfect out of the oven. These cookies were eaten up so fast, I was lucky to snapped this photo of them before they disappeared! 5 Stars!